Walmart, Home Depot and Traer Creek Plaza are located on the eastern edge of the valley floor. Behind Traer Creek Plaza and to the west of Post Boulevard are the undeveloped portions. Following the drone footage west from Plaza, there will be mostly residential until Planning Area A where the Beaver Creek Rodeo Grounds and Salvation Army are currently located. Planning Area A is currently thought of as the walking Village, consisting of a charming mix of restaurants, shops, hotels and residences. The Village will provide a connection to the eastern edge of the Town of Avon, enhancing the synergy of our Town. 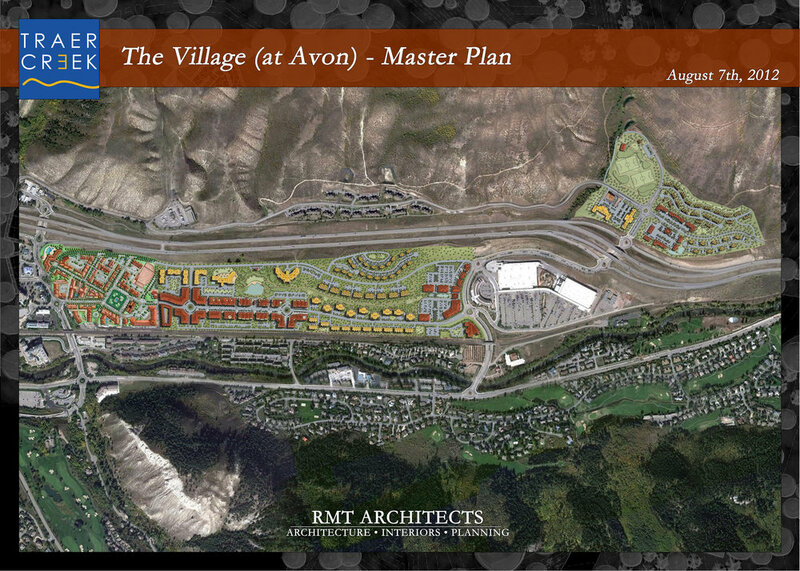 There aren’t many 1,800 acre parcels on the Western slope of Colorado as primed for projects as The Village at Avon. Annexed into the Town of Avon, Colorado in 1998, the storied tract, located between west Vail and east Avon is home to Traer Creek Plaza, The Avon Ambulance District, Buffalo Ridge Housing, a Walmart Supercenter and a Home Depot. Traer Creek is located between the legendary Vail and Beaver Creek Mountains—two of the premier ski resorts in the country. The Master Plan is conceptual in nature and depicts what could be done within the Village valley floor and just north of the I-70 based on zoning per the PUD. Planning Area J is located just north of I-70 exit 168. It is currently contemplated that Planning Area J will consist of a mix of convenience oriented retail including a gas station and restaurants and associated uses as well as a residential and hotel component. Reviewing the drone footage (that is moving east) one sees the Traer Creek Ambulance Response Station in the foreground, also located within Planning Area J (on that piece of land sometimes referred to as “N South”). Block 1 and Block 4 are two tracts of land with prime visibility from the freeway. The Legend Real Estate Group is currently marketing the roughly 6 acre Block 1 within Planning Area J for ground lease and development for convenience oriented retail. Click here to download Legend's Block 1 marketing packet. Legend brought IKEA to Denver’s Jones District and is known for partnering key retailers with developers and land investors. Legend’s predominate focus has been on national retailers ranging from smaller users to big box tenants. They represent retailers entering the Colorado market for the first time as well as specialty venues such as theatres, health clubs and regional single store concepts. Key clients include: AMC Theaters, Bed Bath & Beyond, Best Buy, Cost Plus, World Market, IKEA, Michaels, PINSTRIPES, Sears Holdings, Sportsman’s Warehouse. Click on the button below for downloadable P.U.D. and D.R.B. guidelines.